As a Sugar Land area financial professional, our mission is simple: to guide and strengthen each client's investment portfolio using the tools and strategies that best suit his or her needs. In pursuit of this goal, we assist the client employ a comprehensive range of account types and planning methods, including international and domestic equity portfolios, mutual funds, tax-deferred annuities, new and improved "hybrid" annuities, life insurance, municipal and corporate bonds, college savings plans and alternative investments for accredited as well as non-accredited investors. Post Oak Capital Group does not simply provide a comprehensive range of financial planning and investment management services to a diverse Houston-area client base. 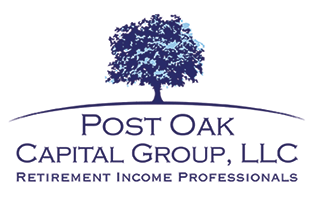 Every Sugar Land area retirement professional at Post Oak Capital Group has the experience necessary to deliver the service our clients expect. With more than 50 years of combined experience in financial planning, our family-oriented financial planners stay up on the latest developments in the securities and wealth management businesses. All carry Series 7 and 63 licenses as well as Texas insurance licenses. Several have obtained additional securities licenses, including FINRA Series 24 and 53 (Keith Patterson) and FINRA Series 66 (Frank Richardson). Post Oak Capital Group is committed to superior service. We consult closely with each new client to develop a thorough understanding of their unique goals and objectives. We then follow up with a comprehensive strategic vision that implements these goals and objectives. Our consummate professionals are equally comfortable assisting with planning for a child's college education, ensuring that clients maintain the lifestyles to which they are accustomed, addressing retirement income needs and helping our clients pass on their assets to beneficiaries in a fitting, tax-efficient manner. Most importantly, we strive to deliver the highest level of service and make each client feel truly special. Our Better Business Bureau Accreditation and numerous longstanding client relationships attest to our ability to make good on our promise of superior performance. At Post Oak Capital Group, we succeed only when our clients succeed. As a Sugar Land fee based or traditional financial planner, our team acts in the best interests of our clients - not our bottom line. Moreover, we offer a range of tools to improve clients' financial literacy and empower them to seize their financial future. From onsite calculators and research reports to complimentary Financial Workshops/Monthly Speakers' Bureau Dinners that provide current and prospective clients with insight into complex financial topics and access to first-rate experts, our client-facing resources are second to none. For a no-obligation financial review with one of our experienced professionals, fill out the contact form or call us at (713) 960-6949.